A 95 million-year-old fossilized jaw discovered in Texas has been identified as a new genus and species of flying reptile, Aetodactylus halli. Aetodactylus halli is a pterosaur, a group of flying reptiles commonly referred to as pterodactyls. The rare pterosaur — literally a winged lizard — is also one of the youngest members in the world of the pterosaur family Ornithocheiridae, according to paleontologist Timothy S. Myers, who identified and named Aetodactylus halli. The newly identified reptile is only the second ornithocheirid ever documented in North America, says Myers, a postdoctoral fellow in the Huffington Department of Earth Sciences at Southern Methodist University in Dallas. Aetodactylus halli would have soared over what is now the Dallas-Fort Worth area during the Cretaceous Period when much of the Lone Star state was under water, covered by a vast ancient sea. While rare in North America, toothed pterosaurs belonging to the Ornithocheiridae are a major component of Cretaceous pterosaur faunas elsewhere in the world, Myers says. The Texas specimen — a nearly complete mandible with most of its 54 teeth missing — is definitively younger than most other ornithocheirid specimens from Brazil, England and China, he says. It is five million years younger than the only other known North American ornithocheirid. Myers describes the new species in the latest issue of the Journal of Vertebrate Paleontology. Go to http://www.smuresearch.com/ to see illustrations of Aetodactylus halli and the Cretaceous marine environment, an image of the fossilized jaw and links to more information. Myers named the pterosaur Aetodactylus halli after Lance Hall, a member of the Dallas Paleontological Society who hunts fossils for a hobby. Hall found the specimen in 2006 in North Texas. It was embedded in a soft, powdery shale exposed by excavation of a hillside next to a highway. The site was near the city of Mansfield, southwest of Dallas. Hall donated the specimen to SMU. Pterosaurs ruled the skies from the late Triassic, more than 200 million years ago, to the end of the Cretaceous, about 65 million years ago, when they went extinct. They represent the earliest vertebrates capable of flying. The Aetodactylus halli jaw was discovered in the geologic unit known as the Eagle Ford Group, which comprises sediments deposited in a shallow sea, Myers says. Outcrop of the Eagle Ford Group extends northward from southwestern Texas into southern Oklahoma and southwestern Arkansas. "I was scanning the exposure and noticed what at first I thought was a piece of oyster shell spanning across a small erosion valley," Hall recalls of the discovery. "Only about an inch or two was exposed. I almost passed it up thinking it was oyster, but realized it was more tan-colored like bone. I started uncovering it and realized it was the jaw to something — but I had no idea what. It was upside down and when I turned over the snout portion it was nothing but a long row of teeth sockets, which was very exciting." SMU vertebrate paleontologist Louis L. Jacobs, a dinosaur expert internationally recognized for his fossil discoveries in Texas and Africa, and SMU paleontologist Michael J. Polcyn, recognized for his expertise on the extinct marine reptiles called mosasaurs, both told Hall it was a pterosaur and an important find. The 38.4-centimeter Aetodactylus jaw originally contained 54 slender, pointed teeth, but only two remain in their sockets, Myers says. The lower teeth were evenly spaced and extended far back along the jaw, covering nearly three quarters of the length of the mandible. The upper and lower teeth interlaced when the jaws were closed. In Aetodactylus, changes in tooth size along the jaw follow a similar pattern to those of other ornithocheirids. However, Aetodactylus differs from all other ornithocheirids in that its jaws were thin and delicate, with a maximum thickness not much greater than 1 centimeter, Myers says. But the specimen does compare favorably with Boreopterus, a related pterosaur from the Early Cretaceous of China, in terms of the number of teeth present in the lower jaw, he says. 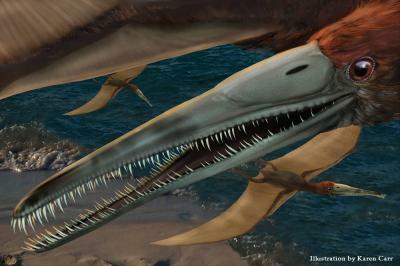 Myers has estimated the wingspan around roughly 3 meters, or about 9 feet, indicating Aetodactylus would have been a "medium-sized" pterosaur, he says. While it's not known how Aetodactylus died, at the time of death the reptile was flying over the sea and fell into the water, perhaps while fishing, Jacobs says. North American pterosaurs that date from the Cretaceous are all toothless, except for Aetodactylus and Coloborhynchus, Myers says. The thinness of the jaws, the upward angle of the back half of the mandible and the lack of a pronounced expansion of the jaw tips indicate that Aetodactylus is different from other ornithocheirids and represents a new genus and species of pterosaur. "Discovery of another ornithocheirid species in Texas hints at a diversity of pterosaurs in the Cretaceous of North America that wasn't previously realized," Myers says. "Aetodactylus also represents one of the final occurrences of ornithocheirids prior to the Late Cretaceous transition to pterosaur faunas that were dominated by the edentulous, or toothless, species." Much of Texas was once submerged under the Western Interior Seaway. The massive sea split North America from the Gulf of Mexico to the Arctic Ocean. On shore, the terrain was flat and flowering plants were already dominating flora communities in this part of North America, according to paleobotanist Bonnie Jacobs, associate professor of Earth Sciences at SMU. "There were still conifers and ferns as well, but mostly of the sort that had tiny needle leaves, like junipers," says Bonnie Jacobs. "Sycamores and their relatives would have been among the flowering plants." The first ornithocheirid remains from North America, discovered in Fort Worth, were described by former SMU student Young-Nam Lee and donated by amateur collector Chris Wadleigh, says SMU's Louis Jacobs. "The ancient sea that covered Dallas provided the right conditions to preserve marine reptiles and other denizens of the deep, as well as the delicate bones of flying reptiles that fell from their flight to the water below," says Louis Jacobs, a professor in SMU's Huffington Department of Earth Sciences. "The rocks and fossils here record a time not well represented elsewhere in North America. That's why two species of ornithocheirids have been found here but nowhere else, and that's why discoveries of other new fossils are sure to be made by Lance Hall and other fossil lovers."